Bad Bird is the perfect example of East meets West. We went on a relatively quiet and slow lunch day at Hole in the Wall yet this store was so busy taking orders, cooking and serving platters after platters to its eager and hungry customers. Of course, we just had to join in the fun (a.k.a. nakiki-uso) too! 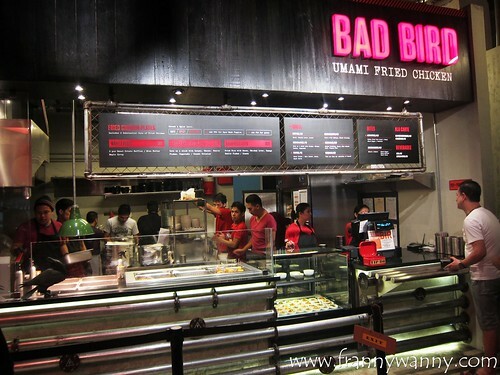 This stall specializes in umami fried chicken which are perfectly deep-fried and coated in their special flavors. What makes this food concept so interesting is how fried chicken, which is very western, pairs so well with a wide-array of Asian-inspired side dishes -- Kimchi coleslaw, corn covered with Japanese Kewpie mayo and bonito flakes, Waffle with Miso Butter and more! It's definitely the place where Uncle Sam and Mr. Miyagi can happily dine in together. 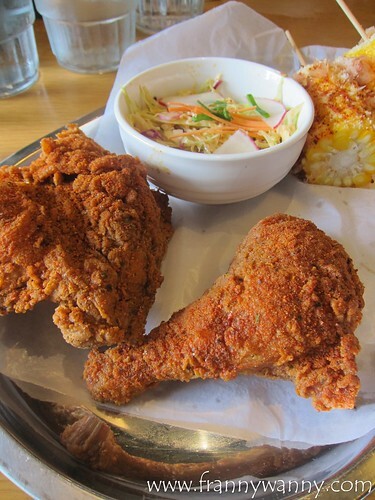 Each fried chicken plate comes with 2 substantial cuts of chicken. Do take that phrase seriously as those cuts are HUGE! While others would just hide the tiny meat within a thick breading, this one seriously was all meat. One piece was filling enough so just imagine us having 4 huge chicken pieces on top of all the other dishes that we ordered that day. #whatisgluttony You also get the option to go for safe, spicy or chemical. Wanting to play it safe, I tried both spicy and safe and steered clear of chemical as it sounded...scary. There are three platters available: Waffle Plate (Php. 290), Corn & Coleslaw Plate (Php. 330) and Dirty Rice Plate (Php. 320). We went for the first two with additional order of the dirty rice (Php. 85). 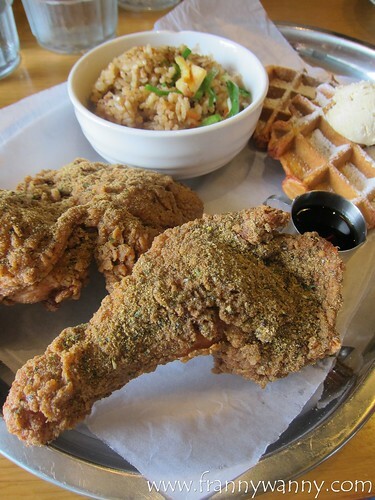 The Waffle Plate comes with two pieces of Sweet Potato Waffle, Miso Butter and Maple Syrup together with two pieces of fried chicken. I was blown away by the yummy chicken and couldn't stop raving at how flavorful each bite was. We had the "safe" chicken which was pretty good. The chicken was impressive as we enjoyed the juicy meat within the crispy skin. I wasn't too crazy over the waffle though. We might have left it out too long that it turned out to be too chewy and bland to be fully enjoyed. Not even the miso butter helped save these sad waffles from being ho-hum. Perhaps they can turn it into a crunchy bacon waffle with truffle bacon butter too? Now, that sounds interesting, doesn't it? I may be allergic to corn but that didn't stop me from ordering the Corn & Coleslaw Plate for my family to try. My oh my, if you can just see the corn up close. It looked sooo mouthwatering in whatever angle. How can it not be? Grilled corn covered with sweet Kewpie Japanese mayonnaise, cheese and bonito flakes. How I wish I can have a bite of this. *sigh* Instead, I watched my dad, Paul and sister enjoyed every single piece of corn kernel. The Dirty Rice (Php. 85) was also worth noting. Delicious and fragrant fried rice cooked with bacon, chicken liver and bonito flakes. It is closely similar to the teppanyaki-style Japanese fried rice only with that special umami kick. There's more to try at Bad Bird at Hole in the Wall. One of which is the Hush Puppies which I heard are excellently deep-fried corn bread. Not sure if it's corn kernel-free but anyway, do let me know what to think of it ok?